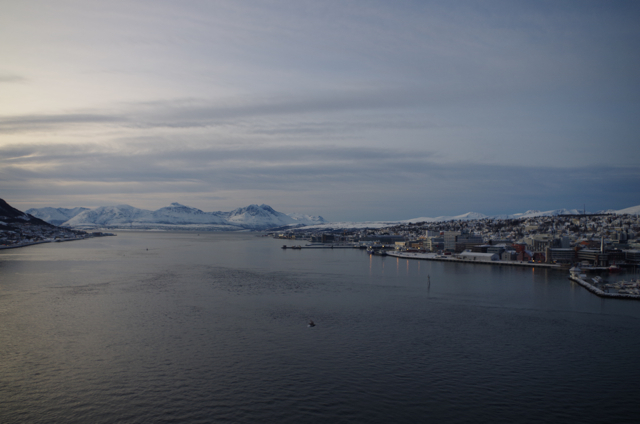 Arctic Frontiers, an annual conference on development in the Arctic intended largely to bring together policy makers, scientists, and academics, took place for the ninth year in a row in Tromsø, Norway. The theme of this year’s conference focused on “Humans in the Arctic.” The more prosaic, but no less important, conference theme contrasted with that of the previous year, “Geopolitics and Marine Production in a Changing High North.” Discussions about hypothermia, search and rescue, and miners, among other topics, replaced the grand strategy and foreign policy debates of 2013. Arctic Frontiers has long been one of the premier venues for discussions on the Arctic, although the October 2013 debut of the larger Arctic Circle conference in Reykjavik, Iceland attempted to challenge Arctic Frontiers’ premier position. Yet why is an Arctic conference newsworthy? First, conferences, especially those that do not switch locations every year, are a way of establishing a city as a center of knowledge production. Supporting this sector allows for Arctic communities to have an economic alternative to the usual reliance on natural resource development. Second, with both Arctic Frontiers and Arctic Circle attracting their host country’s leaders – Norwegian Prime Minister Erna Solberg in the case of the former and Iceland President Ólafur Ragnar Grímsson in the case of the latter – they are important venues for foreign policy discourse. Originally, it was rumored that the second Arctic Circle would take place in Anchorage, Alaska in 2014. Icelandic President Grímsson and Alaskan media mogul Alice Rogoff are the conference’s main backers, so a switch between the two locations seems natural. Yet Arctic Circle 2014 will take place in Reykjavik once again before switching to Anchorage the following year. Whatever the reasons behind the decision to host Arctic Circle in Reykjavik in 2014, it will surely help to further bolster Reykjavik – and, more broadly, Iceland – as a hub for discussions about the Arctic. Reykjavik, and arguably even Tromsø, are better positioned than Anchorage to become centers of circumpolar knowledge production. Iceland, for instance, is easier to reach than Alaska from destinations in North America, Europe, and even Russia. Due to the way air route networks are structured, even flights from easternmost Chukotka in Russia often have to transit through Moscow instead of being able to hop a few hours across the Bering Strait. In the case of Norway, quickly expanding Norwegian Air runs a direct flight from Tromsø to London, reducing the journey from the capital of the UK to Arctic Norway to a mere three hours. The airline will also soon establish more direct connections from Oslo abroad, including to the west coast of North America, helping to better position Norway to attract both business and tourism in a globalizing world. With the opening of the Arctic Council’s Permanent Secretariat in Tromsø and the strong Arctic research programs at the University of Tromsø (UiT) complementing the continuation of Arctic Frontiers, Norway’s northernmost big city is strengthening its position as an “Arctic capital.” Tromsø is also an important gateway to Svalbard, one of the most important Arctic research hubs. As Norwegian oil production moves north, too, the city could become more important economically as well – perhaps one day into a sort of northern Stavanger. By order of listing, the second most important sponsor of Arctic Frontiers is ConocoPhillips, an oil corporation with a stake in Arctic development. In order for Arctic Frontiers, and Tromsø, to cement its position as a center for Arctic expertise, and to live up to Prime Minister Solberg’s proclamation in her speech that “knowledge is one of our top priorities and is at heart of our policies in the Arctic,” more overtures will need to be made to the local community. Arctic Frontier’s hefty registration fee was significantly higher than that of Arctic Circle, which was also free for both students and local residents. In Reykjavik, I even met a couple of locals who were volunteering as notetakers at the event, which seemed to have made its presence known amongst locals. Meanwhile, some residents in Tromsø that I met without ties to the university or to Arctic research did not know that the conference was taking place. Perhaps more involvement with the local community, whether through free admission and possibly panels with people from Tromsø, might help to enhance the theme of “Humans in the Arctic” should it be revisited in future. To be fair, there were some significant outreach events, such as the Association of Early Polar Career Scientists (APECS), which held a poster contest at area high schools. I also met one high school student attending the conference for one day from Kvaløya, near Tromsø. Next year, the theme of Arctic Frontiers will be “Climate and Energy.” As a fellow PhD student remarked, “It’s back to basics” for the conference organizers. Issues like climate, energy, and geopolitics are the bread and butter of Arctic conferences, whereas topics such as search and rescue, though just as important, are more nitty-gritty and make for less exciting headlines. 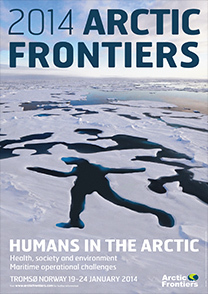 With this topic, Arctic Frontiers 2015 will likely attract a lot of Arctic movers and shakers. Hopefully, the conference will still in some way carry on the theme of “Humans in the Arctic” by further advancing ties with the inhabitants of northern Norway, as climate and energy also have unmistakably local dimensions that are often overlooked in favor of global commodity cycles and international trade routes.